Among my sisters, Gitke was the only one who shared my ideas. She was a Zionist and a member of "Hechalutz" like me, and wanted to make "Aliyah". She and I, along with our brothers Yaacov-Hirsh and Leibl, believed that Eretz Israel is the only answer to the "Galut" (exile). My other two sisters, Rivka and Rachel-Lea, did not understand this dream. They did not want to live in the desert and be baked in the heat of the hot sun. They felt comfortable where they were and had no desire for any revolutionary change. Gitke joined a Vishnivean group from "Hechalutz" who went on "Hachshara" in Lida. The "Hachshara" prepared them for establishing kibbutzim in Eretz Israel. The new model of the kibbutz communal life was thought to be most suitable for successful settlement and overcoming harsh conditions in Palestine. The "Chalutzim" in Lida actually lived in a kibbutz setting sharing everything. There were 1200 of them living in a big house with large fields. They got only partial support from the "Hamisrad Ha'Eretz Israeli" (affiliated with the Jewish Agency), which was not even enough for basic survival. In addition, "Hamisrad" could not get them more than one or two "Certificates" (immigration visas) per year. The situation was indeed so bad that the "Certificates" had to be sold to affluent Jews, who wanted to make "Aliyah", in order to buy food for the "Chalutzim" members. 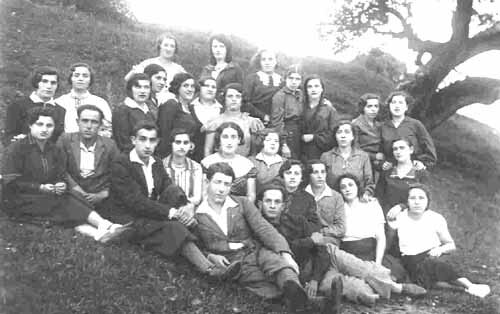 The kibbutz members came from all over Poland and Galicia. These young people were idealists who felt privileged to work in menial jobs such as wood chopping or emptying garbage. When living back at home, such work was often done by Gentiles. However in the kibbutz they wanted to change the world and be changed with it. 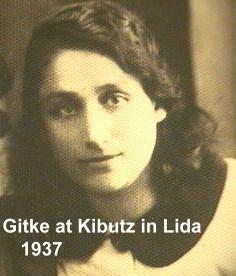 .……..At the time I was studying in Vilna, this kibbutz was located there too (only later it moved to Lida). One day I met an old acquaintance from Vishnive, who lived in Vilna. He said, "Oy Vey, Ich Ob Zich Azoy Farsheimt SheFeitl Dikenshtein Hot Geshtenen Mit Eli Borech Dem Rov Un Gehakt Holtz". This meant, "Oy Vey, I was so ashamed to see Feitl Dekenshtein and Eli Baruch, the Rabbi's son chopping wood". He was so embarrassed to see them doing this menial job, that he left quickly avoiding even saying "Hello" to them……..
Before Gitke went on "Hachshara" in 1935 I sewed her some very nice clothing so that she would look good there. What did they do? Since this was a commune, she had to give her clothing to a girl who was making "Aliyah". Even now I am angry when I think about it. The truth was they did not have anything to eat or drink They lived there on "Luft and Libe" (air and love). They had double-decker beds and would sleep 4 in a bed. There were not enough beds and many had to sleep on the floor. My sister got a cold and became hoarse. When I left for Eretz Israel, she was still hoarse. It was forbidden to tell at home how they were living. My mother kept quiet about this too. Gitke got married in the kibbutz. Her husband was the only son in his family with six sisters. His family was living in a shtetl near Vilna and selling fish. His name was Leizer Okon I never met him. Gitke loved him. They were married by a Rabbi, although many couples in the kibbutz were not wed. No children were allowed to be born in this kibbutz. As I mentioned before, the kibbutz sometimes got two "Certificates" from "Hamisrad". Whoever had money could immigrate. Unfortunately, my sister could not get any loan to fulfil her dream of "Aliyah". My brother Leibl got Ulcers and all our family's savings were spent on medicines, hospital in Vilna, physicians and "Felshers". He had severe attacks in which the pain could hardly be contained.